A campaign called ‘Prosperous Pakistan’, initiated by a private investment group has been launched in London by utilising the iconic double-decker buses that drive around in the metropolis with an aim to project Pakistan’s image as an emerging country in the world economy. This is the second campaign carried out by the privately held investment company CPIC; highlighting a positive image of Pakistan in London. 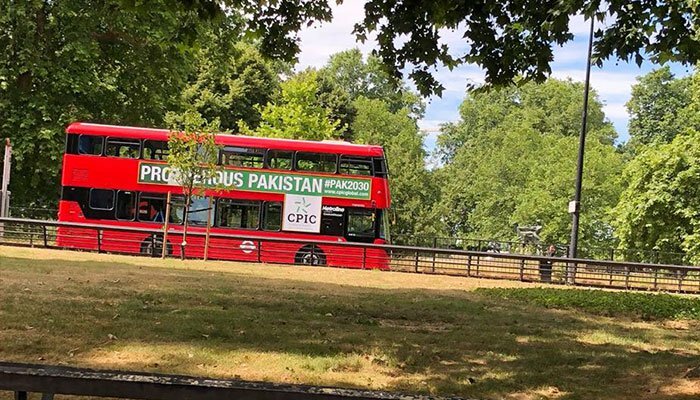 CPIC is a privately-owned company, headquartered in London which focuses on real estate investment opportunities within the $62 billion China Pakistan Economic Corridor (CPEC) and has placed the huge banner on the side of 100 buses carrying the words “Prosperous Pakistan, #Pak2030, CPIC” for two weeks. The buses will run across a vast London network, including the central London zones, for two weeks, potentially having seen by tens of thousands of people. CPIC board member Zeeshaan Shah said the campaign is targeting the opportunities Pakistan has to offer. “With a GDP that has grown for five straight years, poverty rates falling, education improving and a young, ambitious population, Pakistan has much to offer foreign businesses. Our mission at CPIC is to start a global movement to showcase the best of Pakistan,” said Zeeshan. “Over time and through the #Pak2030 campaign, we will highlight Pakistan’s strengths, passions and points of interest so that we can inform, educate and excite the world and correct some of the misconceptions that are often perpetuated. I request all Pakistanis all over the world to join us in this movement and show the world the true face of Pakistan,” he added. “This is just the start. Pakistani are a brave and resilient nation and have seen lots of turbulence but we have turned a corner in our future and in coming years we will be one of the most prosperous countries in Asia,” he added further. “There is a growing middle class and they have got spending power. They need to realise the opportunities that Pakistan presents and be part of Pakistan’s growing spending power and that’s possible through investment,” Zeeshan concluded.